French style faux plants, trees and wreaths for a warm welcome. Holiday ready. Topped with an abundance of large, purple blooms, this robust Spanish lavender makes a fragrant addition to any room. Each plant arrives ready for display in a metal pot. Topped with starry, white flowers, this unusual and elegant hydrangea arrives ready for display in a square black metal pot. This white moss wall with fuchsia lips will add a pop of color to any room. Nontoxic preservation; requires no care whatsoever. Avoid direct sunlight. Wood frame. Miniature landscape with gentle rolling hills of moss that beckon and soothe you with subtle shades of green and other natural elements that evoke simplicity and peacefulness. This artwork is created from preserved misses of reindeer and preserved foliage. Nontoxic preservation; requires no care whatsoever. This vibrant rainbow of color designed using preserved moss will brighten up any space in your home or office. Nontoxic preservation; requires no care whatsoever. Avoid direct sunlight. Wood frame. Soft bunches of natural, preserved reindeer moss form this woodsy, handmade circlet for the home or doorstep. Layers of soft rose petals and buds in warm, variegated hues create a fresh presentation in this wreath. Display it above a mantel or console for a charming and welcoming accent. DRIED LAVENDER WREATH LIVE HYDRANGEA & ECHINOPS WREATH, 18" LIVE HYDRANGEA & ECHINOPS ROUND WREATH, BLUE, 18"
Our handmade French lavender wreath makes a natural gift that showcases the vibrant purple color and soft fragrance for which the flower is known. Subtle color variations of hydrangea petals and fanciful echinops blooms intermingle beautifully with rich green salal leaves on this artisanal wreath. Carefully cultivated in California, this live wreath is a natural accent in any room, and makes a welcome hostess gift. Subtle color variations of hydrangea petals and fanciful echinops blooms intermingle beautifully with rich green salal leaves on this artisanal wreath. Carefully cultivated in California, this live wreath is a natural accent in any room, and makes a welcome hostess gift. HERB WREATH LIVE LAVENDER & HYDRANGEA WREATH, 18" LIVE HYDRANGEA & ECHINOPS SQUARE WREATH, BLUE, 18"
Grown, cut fresh and assembled by hand at a family-owned farm in Salinas Valley, California, our fragrant Dried Herb Wreath is a welcoming accent in any room of the home and also makes an ideal gift. The soft hues of hydrangea and the relaxing scent of lavender blend together in this wreath, making it a welcoming accent in the home. It’s grown in California and assembled by hand for fresh artisanal style. Subtle color variations of hydrangea petals and fanciful echinops blooms intermingle beautifully with rich green salal leaves on this artisanal wreath. Carefully cultivated in California, this live wreath is a natural accent in any room, and makes a welcome hostess gift. Carefully harvested and dried in bundles, these stalks of natural Provence lavender make an ideal gift that showcases the vibrant purple color and soft fragrance for which the flower is known. Either for your own indoor or outdoor garden, or as a thoughtful gift, our live blue hydrangea brings bright blooms and greenery to any space. This lush flowering plant comes straight from the grower in beautiful Northern California. Distinguished by its tall stalks and signature color, lavender has a refreshing, delicate fragrance that has delighted people for centuries. A beautiful addition to almost any garden, lavender can also be dried and used to create a potpourri, allowing its calming scent to be enjoyed throughout the home. Handcrafted floral palm leaf arrangement. Fiberglass/resin urn. Florals: polyester. This taller arrangement of green foliage and banana leaves is a way to add some interest and color in the corner of a room. There is always a place for a green accent in any room and what a wonderful way to add color and texture in an open place. Natural looking maple trees planted in a Tuscan pottery pot. Handcrafted floral arrangement. Polyester greenery. Fiberglass/resin pot. Handcrafted floral arrangement. Polyester greenery. Fiberglass/resin pot. Handcrafted floral arrangement. Polyester greenery. Fiberglass/resin pot. Handcrafted floral arrangement. Polyester greenery. Fiberglass/resin pot. Handcrafted floral arrangement. Polyester greenery. Fiberglass pot. Handcrafted floral arrangement. Polyester greenery. Fiberglass/resin pot. Handcrafted floral arrangement. Polyester greenery. Fiberglass/resin pot. Handcrafted floral arrangement. Polyester greenery. Fiberglass/resin pot. Enhance a living room corner with this broad-leafed faux philodendron, as ideal for mid-century aesthetics as it is for contemporary spaces. Handcrafted floral arrangement. Polyester greenery. Fiberglass/resin pot. Handcrafted floral arrangement. Polyester greenery. Fiberglass/resin pot. The large green leaves of the Burdock bring a lush accent to a room. 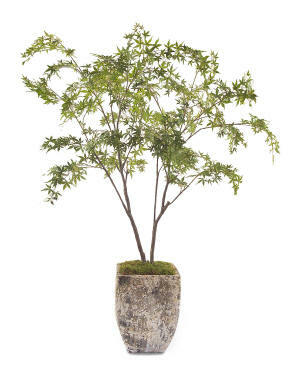 Place this plant in any part of the home for a refreshing update. Potted faux fiddle leaf plant that brings refreshing beauty to your space year ‘round, with no upkeep needed. Featuring greenery that looks so natural you’ll forget you don’t ever have to water it. Add height, dimension, and color to any room all year long with this faux plant with extra long branches, perfect for hanging. Hand-selected for their exceptionally natural appearance, our faux stems are modeled after specimens from gardens around the world. Add height, dimension, and color to any room all year long with this faux plant with extra long branches, perfect for hanging. Hand-selected for their exceptionally natural appearance, our faux stems are modeled after specimens from gardens around the world. Add height, dimension, and color to any room all year long with this faux plant with extra long branches, perfect for hanging. Hand-selected for their exceptionally natural appearance, our faux stems are modeled after specimens from gardens around the world. Made of polyester, styrofoam, plastic and iron wire center in a plastic vessel. Features 370 leaves. For indoor use. Potted faux yucca tree that brings safekeeping, purified energy to your space year ‘round. Featuring greenery that looks so natural you’ll forget you don’t ever have to water it. Made of polyester, plastic, iron wire center, PVC leather and styrofoam in a plastic vessel. For indoor use.